Barker, having made a pile in the City, decided to do a spot of fishing in Ireland and ended up going to the same place at least twice a year for the next twenty years. He concentrated on pike and trout, but he seems to have caught more of less everything and could hardly have chosen a more alluring title. The interesting thing is that he did his best to conceal where the fishing was, so you can have some fun trying to guess what the names of the loughs shown on the map on the endpapers really are, although given that all he did was rename the loughs, it isn't too hard to guess. Of course, with a title like that, the secret didn’t last long and even the Borde Failte is in on the act, with the result that you would have to be blind to miss the tagline on the signs to Corofin. The town really is a fantastic place for coarse fishing and there is walking, golf and riding besides, so the family can occupy themselves too, but although there are still trout in the lakes, the numbers have declined sharply since Barker's time and I wouldn't really recommend Corofin from that point of view. An Angler’s Paradise might not be one of the great classics, but it makes a good fireside read, with a glass of whisky to hand and the dog snoring at your feet. 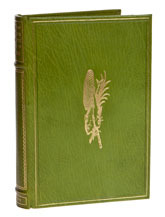 Copies of the first edition can still be had a sensible prices.